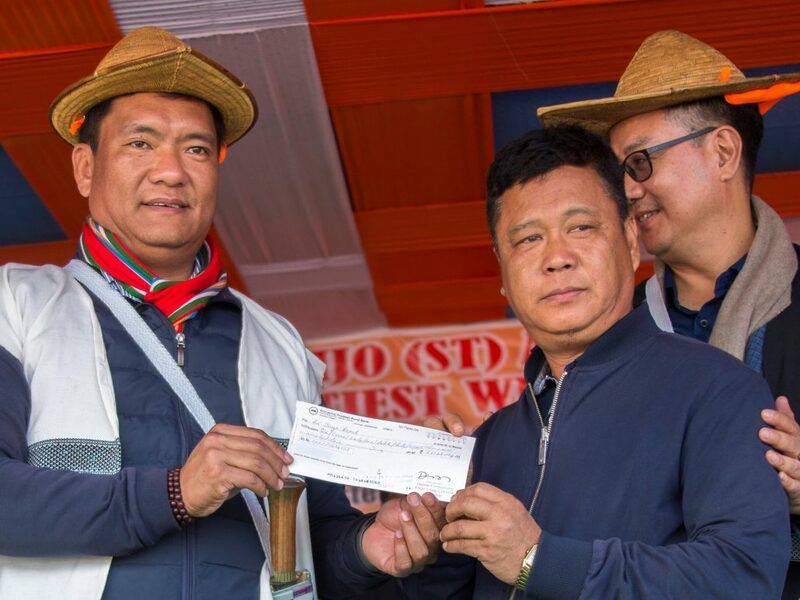 Arunachal Pradesh Chief Minister Pema Khandu on Thursday distributed land compensation cheques worth Rs 53 crore to beneficiaries for the land acquired by the Indian Army at Bora Ropuk village in Upper Subansiri district. Distributing the cheque to representatives of 47 families identified as the beneficiaries, the chief Minister lauded the role of Union Minister of State for Home, Kiren Rijiju in expediting the land compensation payment within a short time. He said no land compensation was being paid by the Indian Army across the country except in Arunachal Pradesh as special case. Khandu further appealed the people to maintain harmonious relation with Army, paramilitary forces. He said the people of Tawang had benefitted enormously with such relations and appreciated the locals for giving away their land for defence establishments. He suggested that a festival celebrating the civil-military friendship could also be celebrated in Dumporijo as it is celebrated in the Tawang and West Kameng districts. Further responding to a public memorandum for recruitment of porters in Indian Army and other jobs for locals, the Chief Minister assured to discuss the matter with the Army authorities. This is not the first instance of villagers in Arunachal Pradesh being paid land compensation for the land acquired by the Army since the early 1960s. Following the Sino-Indo war of 1962, the Indian Army had launched a land acquiring programme to set up bases, construct roads; build bridges etc., in the border state. Until 2016, the villagers hadn’t been paid. However, in April 2017, the Centre released Rs 54 crore for 152 families of three villages of West Kameng district. The Centre in September 2017 issued another set of notifications sanctioning release of Rs 158 crore as compensation for private land taken over in the State by the army. In February 2018, Rs 40.80 crore was handed over to 31 families of Bomja village in Tawang district. While 29 families got Rs 1.09 crore each, one family got richer by Rs 6.73 crore and another by 2.45 crore. In October, a total of Rs 24.56 crore was handed out to five villagers of Singchung from the West Kameng district while Rs 13.17 crore was given to seven residents of Tukpen making them millionaires overnight.